Now, this is the Jackie Evancho I have been waiting for! She is finally singing with the full complement of her enormous vocal ability. But, more on this in a bit. As Runner-Up to singer Michael Grimm on America’s got Talent 5th Season, she instantly became the media darling of the new wave of singers inhabiting the classical crossover genre. The story resonating behind a 10-year-old adorable little girl with a mature classical voice captured fans and musical media pundits from around the world. The whole world wrapped their arms around her lovely, unaffected and genuine persona. What was there not to like? So much beauty, talent and poise in one small package. However, as much as I admired her composure and presence on stage, I was extremely worried about the manner in which she was projecting her voice. Her technique seemed very rigid, her vocal timbre covered and manipulated to create a sound which was not in and of itself authentic. Most definitely, she was gifted with a very special vocal talent. Of this, there was no question. Her musicality and artistry on stage were quite phenomenal. However, technically there were some issues. Her jaw was extremely tight and, more often than not, when she navigated to her upper register, she was not forming that all-important open oval position which is so important to the projected freedom in the soprano register. Her head voice was, for all intents and purposes, locked up behind a rigid vocal masque. 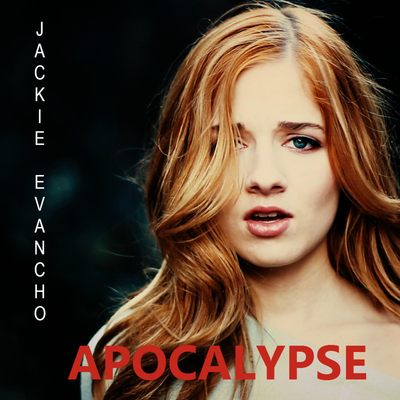 However, in this video of her new pop single, Apocalypse, we hear a different Jacquie – one that has accepted, refined and embraced the enormous beauty of her head voice. She sounds like an angel and, undeniably, is singing with seamless purity throughout her range. I. Love. It. Gone is the dark timbre of the voice we heard when she was on America’s Got Talent. Now, her voice sounds translucent and pure, and her high register pops out like crystalline bells. Gorgeous. And with her lower register ringing with head voice as well, she sings with clear and precise intonation in that area of her range as well. You will also notice that her mouth and jaw are very relaxed in this video , especially when she moves into her upper range. This is as it should be. Her voice is truly liberated and naturally beautiful. You can download Apocalypse on iTUNES or, if you have APPLE MUSIC, you can stream it HERE. It is a wonderful song, beautifully crafted by songwriter/producer Peter Zizzo (Celine Dion, Avril Lavigne) and producer Michael Mangini (Joss Stone. In other words, David Foster made this all happen. He has been a mentor to Jackie pre-America’s Got Talent and is still shaping the trajectory of this talented young lady’s music career. Kudos to all involved. You realize that this is a music video. She is singing to the track but the music you hear is from the recording session master track. Her singing posture in the music video may not be what she uses in a live concert. I suggest you actually attend one of Jackie’s live performances so you do not have to rely on videos to appreciate her phenomenal voice. Some ones technical analysis of Jackies voice doe not impress me. I enjoy Jackies performances the way she chooses to do them at the time she does them David Foster has really been a very supportive person with his own very good, fantastic abilities . He chose to help guide Jackie to where she is today. The fund raiser for Public TV done at Disney was so very, very great showing her ability to reach all of us with her personality and true emotion . Jackie is Great with out technical analysis that is meaningless. Her success says it all. There’s no argument about the lovely timbre of the voice which is a given and you should know, is only raw material. It’s what you do with it that is important. There is not a lot of strain needed to sing notes in a lower middle range heavily miked and amplified. The problem is when she goes slightly higher (not the case previously when she was much younger and there was not such a break) it is like a different voice, or more precisely fades out. When she gets to “crazy”, there should be a crescendo, an intensification that most pop singers would have taken the opportunity to belt out. The reason this is not done, is simply she doesn’t have the chops for this kind of style. According to your resume you should know that a person’s voice is like hair color or shoe size, it really cannot be changed. She is a light soprano and that’s that! There is plenty of beautiful repertoire for a soubrette and maybe even coloratura later on. Come on, even her body type is a give away! Some kids may want to force their voices to sound more raunchy in the spirit of pop but the seams are really showing here. It is a mistake to push the lower notes as this stage at the expense of the rest of the line. The Old Masters started from the middle, strengthened that area and only by steps did they build up a voice in both directions. They did not begin with Nessun Dorma or Ombra Mai Fu, then work their way down with their students. Everything has been done backwards and is a real pity! I thought this review was spot on. Actually, you can HEAR the difference and know how Jackie did it. Seeing is not necessary. This is the ‘free-est’ I’ve ever heard her voice. She is so much at ease, this was truly a breakthrough performance for Jackie, and I’m looking for many more. This kind of commentary is at best trying to degrade Jackie Evanchos great individual talents . Not really appreciated, nothing good going on here at all. Just pure negativity from the commenter. Not needed. Thanks for the analysis of Jackie’s voice MCL. You’re the best. Her voice is amazing, the problem is the piano and background music drown her out. she had the same problem in her early concerts. When she performs with David Foster he keeps the background soft and her voice is what you hear as it should be. If the producers of this had let Jackie’s voice dominate they would have had something amazing. I still love it. There is a large body of commentary on Jackie’s vocal technique, all of it containing contradictory conclusions by various individuals. It’s no wonder that Jackie has, up to now, eschewed formal training. Too many cooks spoil the broth. Jackie will find her own voice in her own way. No matter, her fans love everything she does. I can’t wait to see and hear what she does next. R. Gold. At some point in time, all singers need the security of basic vocal technique. If not, the vocal cords will crash and burn. The Bel Canto technique strengthens the natural voice and develops range,power and nuance. Although it is beneficial for classical singers, it is equally beneficial for every genre of vocal music. Many of the singers I have coached have branched into many forms of vocal performance and the technique enhances rather than impedes their vocal style. It is wonderful to see Jackie embracing a cleaner, more refined style of singing. She is protecting not only her voice but her continued success in the music world. Good for her! Jackie may have good intuition by now, what “works” and what doesn’t but you should know this is not enough. 16 year olds are not experts, otherwise what is the need for voice teachers? “Protecting her voice” means in this case not singing the high notes at all in pop and if need be in concerts will trail out an unsupported falsetto where she still leans her head to one side. It is a real pity not to get proper training for Pete’s sake!